Today, Gran Canaria is one of the most popular destinations within the Canary Island archipelago for tourists from Europe seeking winter sunshine. People flock here for the resorts and beaches, but increasingly many also seek a different experience - a journey up into the mountains which make up so much of the interior of the island. Here one can discover breathtaking landscapes, attractive villages, and sites of considerable historical and archaeological interest. 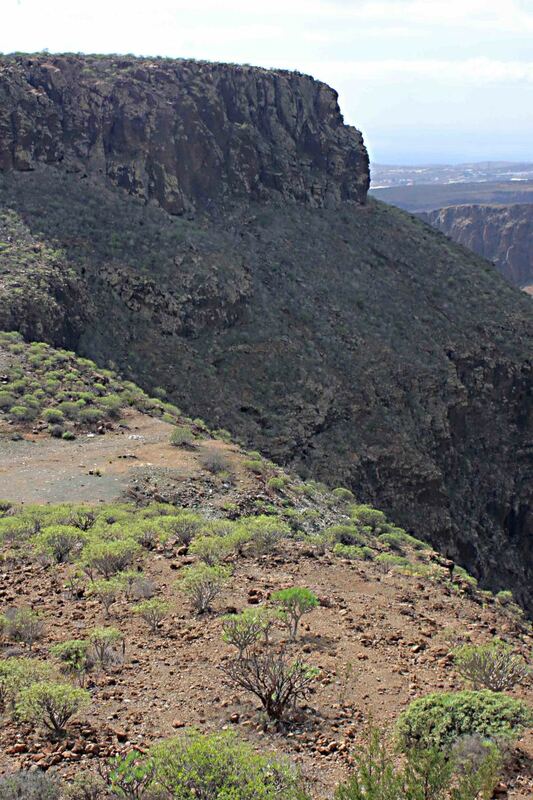 This page looks at the mountains of Gran Canaria through the eyes of a visitor, what to see and how to enjoy the journey. The page also includes the personal experiences of the author during three days in November 2014. All photos on this page were taken by the author during this visit. 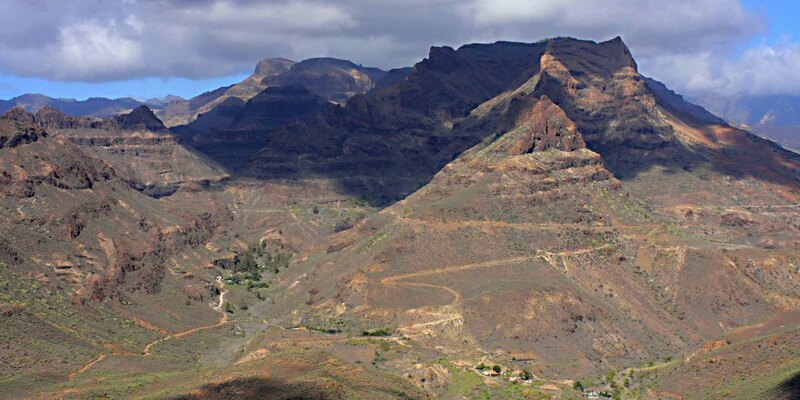 The Island of Gran Canaria was created over a 200,000 year time span in seismic and volcanic events during the Miocene period of geology, between 14 and 9 million years ago. Huge amounts of lava upwelling from the seabed formed the island. This upheaval is sometimes known as the 'Old Cycle' of eruptions. 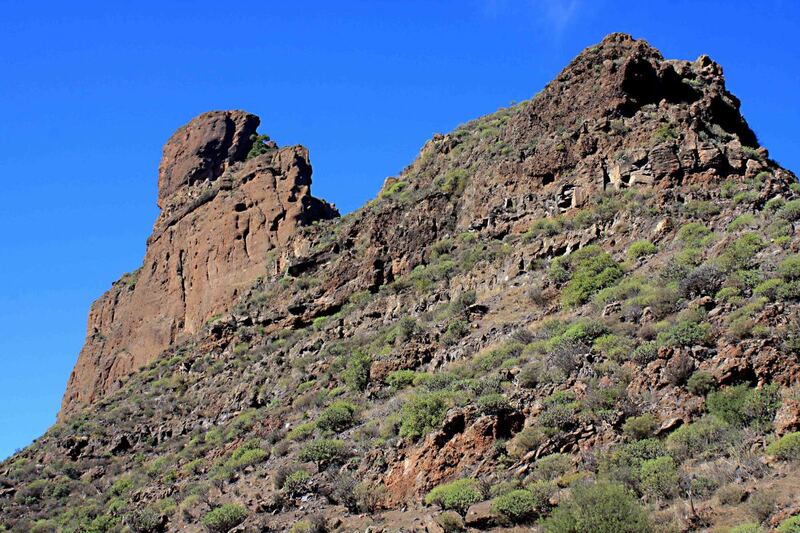 There then followed an era of quiescence before a further series of eruptions - the 'Roque Nublo Cycle' - reshaped the island about 4 million years ago and produced most of the geological landscape we see today. And then a third and final cycle of volcanic events began about 3 million years ago. 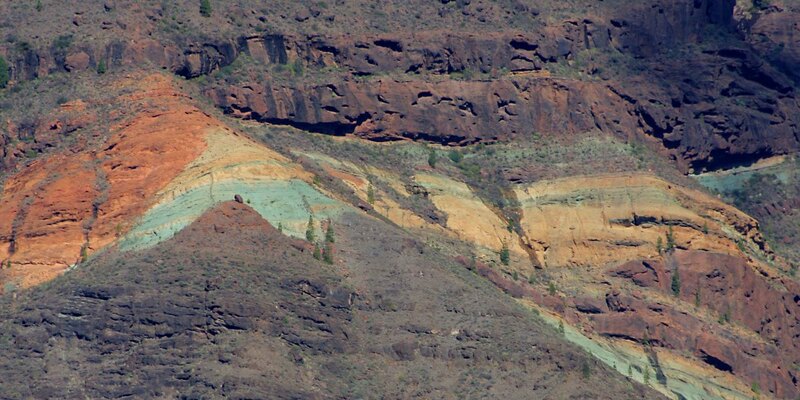 Today, Gran Canaria is considered to still be geologically active, and there well may be further eruptions in the future. 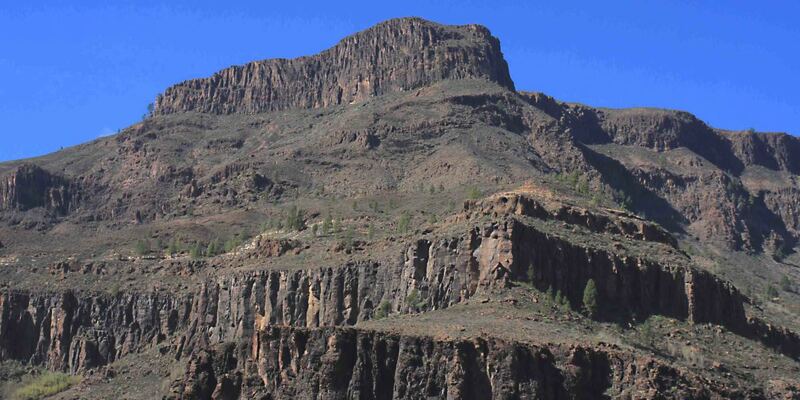 However, the current era is one of dormancy on Gran Canaria and the last eruptions to date occurred more than 3,000 years ago. As a result Gran Canaria lacks the obviously volcanic landmarks of some of the more recently active neighbouring islands in the archipelago. It lacks, for example, a typical volcanic cone such as that of Mt Teide, the volcano which dominates Tenerife, and it lacks the violently scarred landscape which can be found on the Island of Lanzarote, where huge outpourings of lava occurred within the past few hundred years. 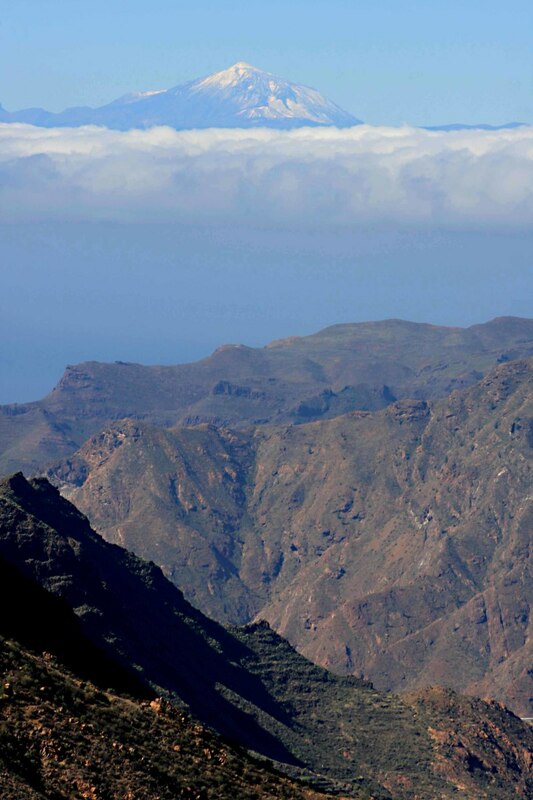 And yet, in terms of average elevation, Gran Canaria is perhaps more mountainous than either of these islands. Across most of the western aspect and the whole of the centre, the land is of high altitude. 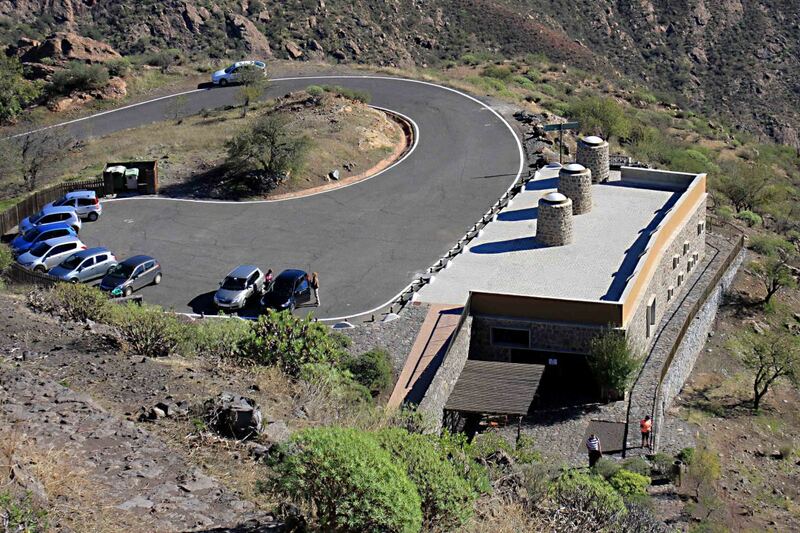 Roughly circular in outline and only 50km in diameter, the highest point of Gran Canaria, Pico de Las Nieves, rises to 1,949m. The principal mountain roads are well maintained, free from pot holes, and clearly marked and signposted, and in almost all places they are lined with crash barriers. They are safe. Having said that, the roads are often winding and at least in some places are not particularly wide, though pull-ins are frequent. 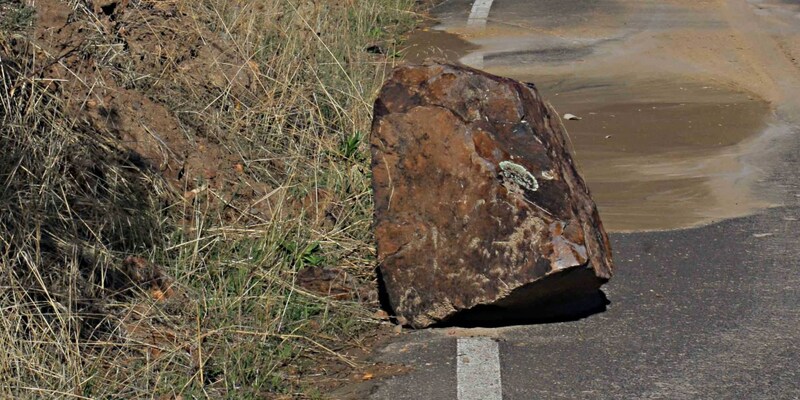 There is of course no street lighting, and an occasional potential issue is falling rocks. 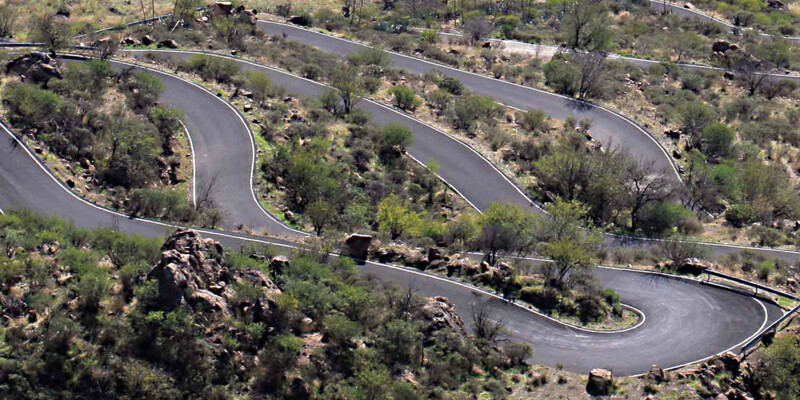 The biggest risks however, would come from driving too fast around bends without clear vision. One must be aware too of the many cycling enthusiasts who use mountain roads throughout the Canary Islands for their sport. I would not advise driving at night, but that aside, with due care and attention the principal mountain roads are easy to negotiate, and they reward any who venture along them with breathtaking scenery around every bend. 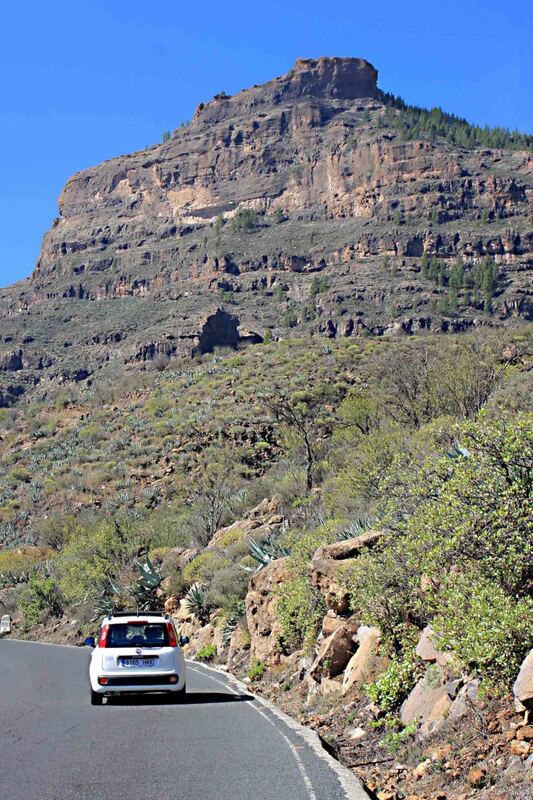 To drive through the mountains of Gran Canaria without a camera is like going to Vegas without any money in your pocket, or heading off on a bird watching holiday without binoculars. 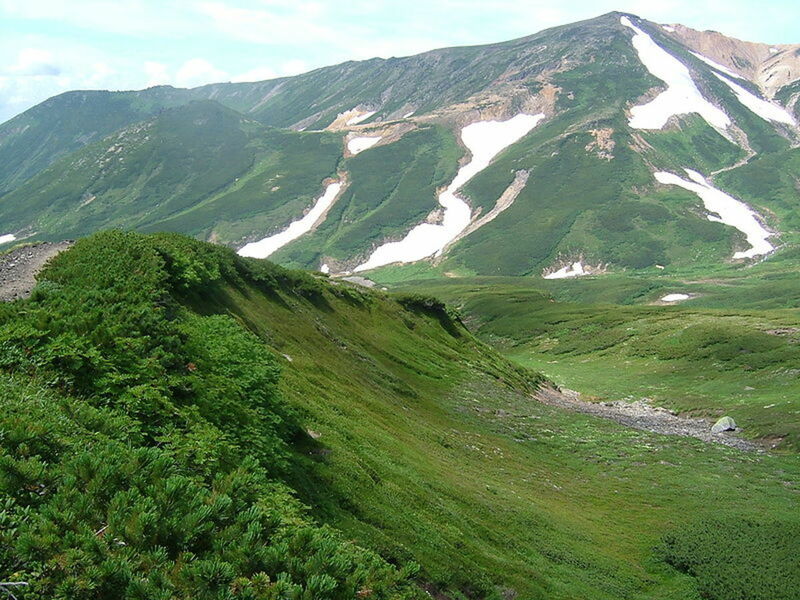 There are several appeals to the mountains of this island, but above all it is the scenery, and recording this scenery with photographs is a joy. A few of the photos taken by the author in Gran Canaria are included here. 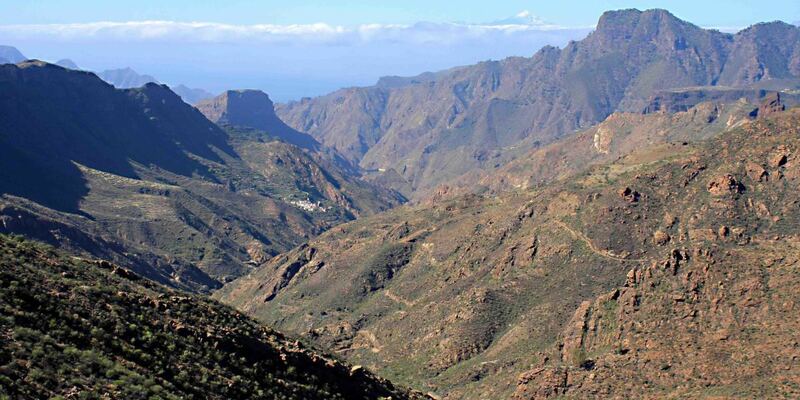 The route one chooses through the mountains of central Gran Canaria depends upon where one is coming from. 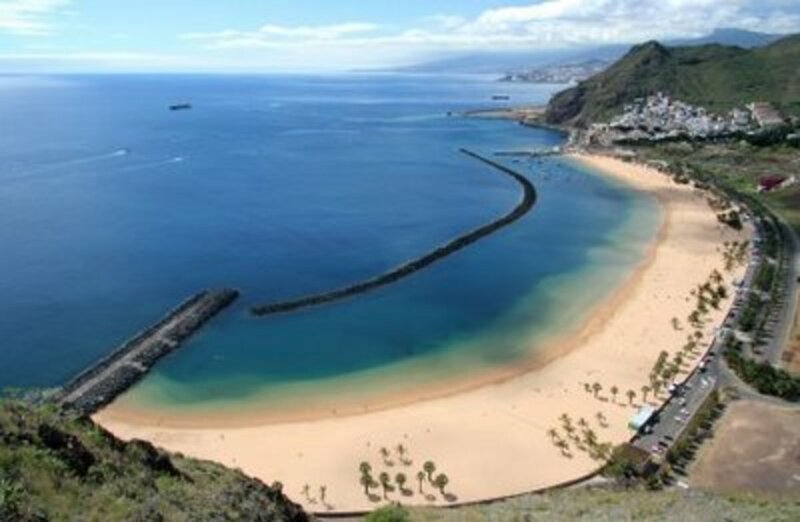 The majority may arrive from the many tourist resorts in the south of the island, and the main road from there is the GC 60 from Maspalomas which takes one past many of the highest peaks on the island. En-route to the centre, the GC 60 connects with the GC 65 from the southeast. From the north and east of the island and the capital, Las Palmas, several roads head into the central mountains. From the west there are only minor roads which head directly up into the mountains, but I would suggest avoiding these; Gran Canaria is not so big, so even by sticking to just the main roads, it's easy to get around and see almost everything that needs to be seen in the space of one day (though more time is recommended)..
A few of the many appeals are included below - the villages, the flora, and the most celebrated view of all to be had on Gran Canaria. 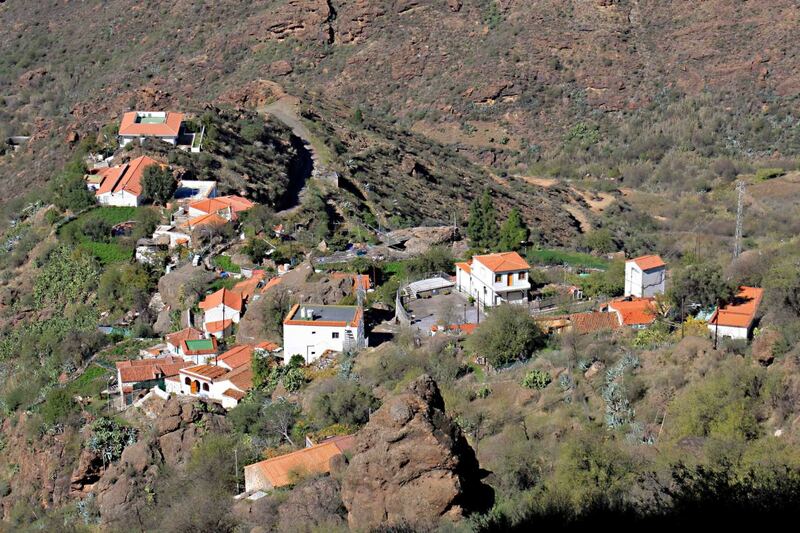 One can imagine that to live in the mountains of Gran Canaria has both its advantages and its disadvantages. 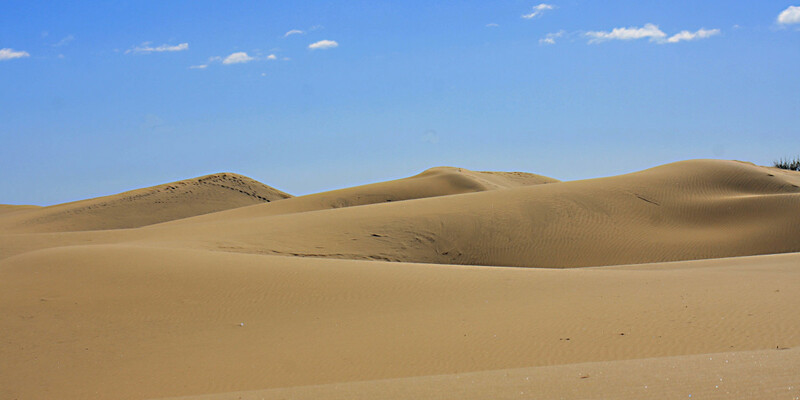 The advantages would include clean air, some respite from the summer heat, and the community atmosphere of village life. The disadvantages may include some adverse winter weather, a lack of local availability of the home comforts of life, and the possibility of temporarily being cut off from the rest of the world. There is one further advantage, and that is the chance each day to awake surrounded by outstanding scenery; an advantage shared by the tourists who visit here. And driving through the villages or seeing the little houses dotted around the mountain tops and down in the valleys certainly adds to the scenic experience. And the villages are also great places to act as bases for short walks into the mountains, and for some rest and refreshments. 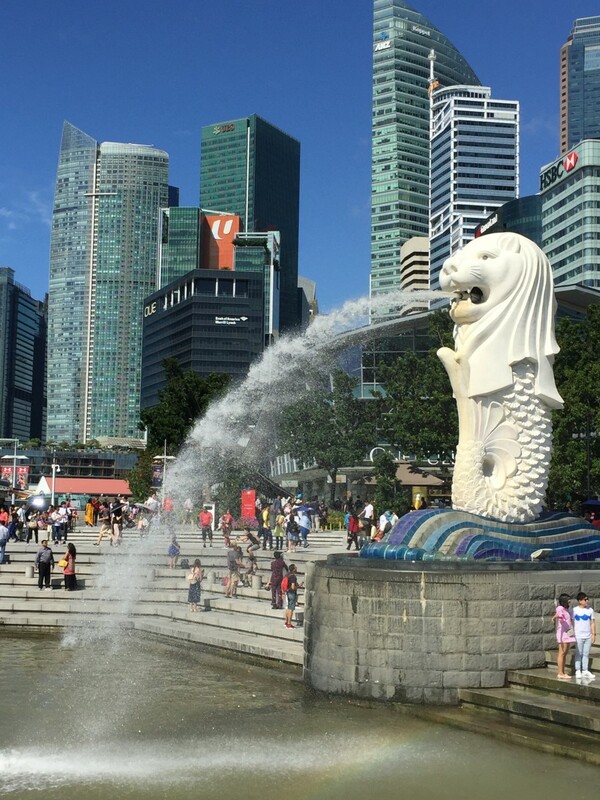 Nowhere are you likely to sample better local cuisine. In one mountain restaurant I had Pimientos de Padrón (salted green peppers) and I have to say that their local version of this dish comes highly recommended! 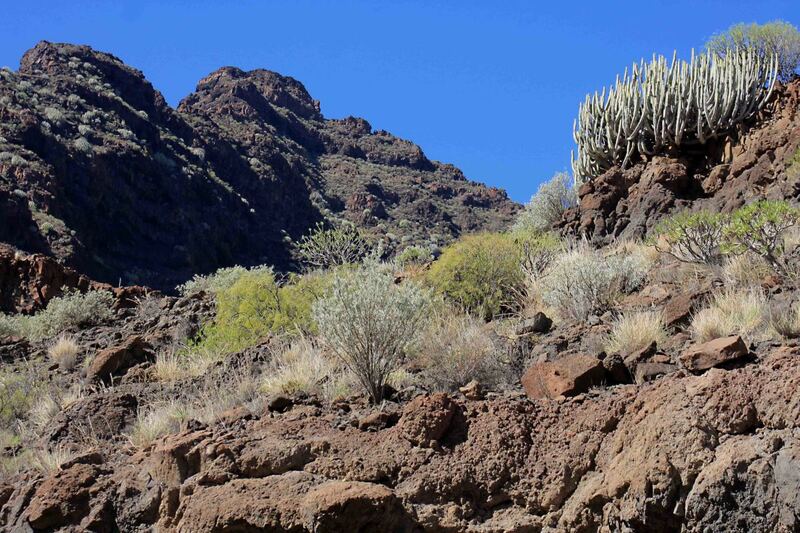 All mountain regions have their own distinctive vegetation, and anyone who has an interest in trees and other plants, will not be disappointed by Gran Canaria. 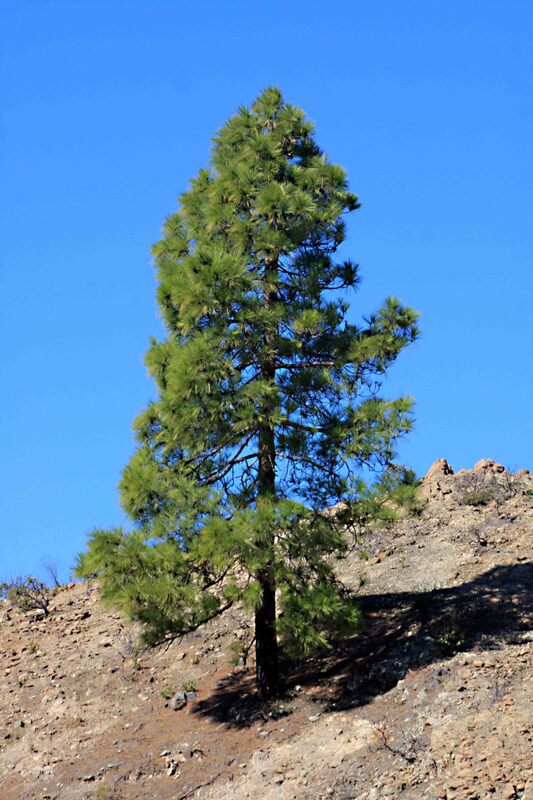 Pine forests dominate the slopes in some of the mountain regions, but in many areas and at high altitude, the climate favours scrubby vegetation and lovers of arid conditions. 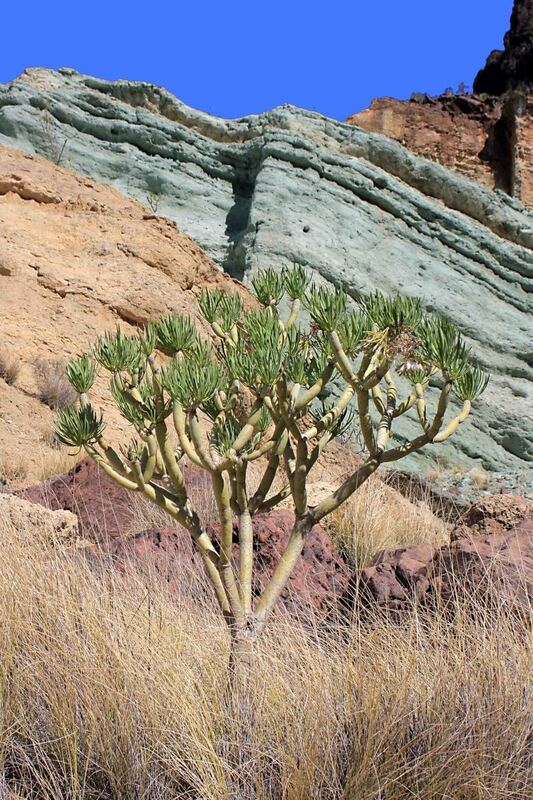 Among the most interesting species are the succulents, some of which are unique to the Canary Islands. 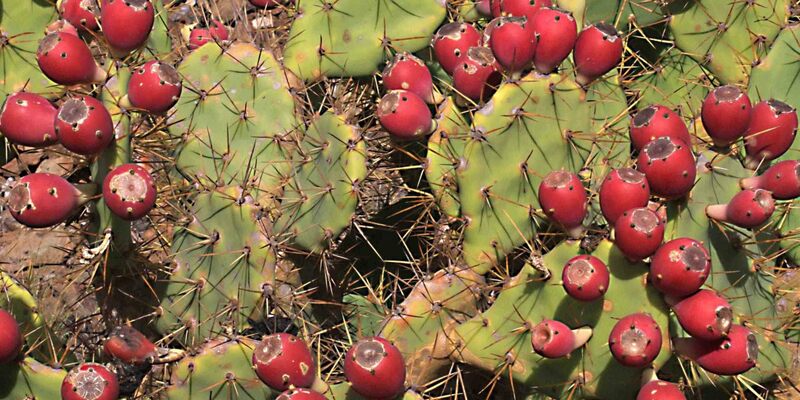 Notable are species of Euphorbia, Aeonium and the non-indigenous Opuntia Cacti. Other plant species including shrubs and small flowering plants may be found if one is prepared to explore further from the road sides - species such as the local blue Viper's Bugloss, Echium callithryrsum, the yellow Giant Fennel, Ferula linkii, and the pinkish Canary Sage Salvia canariensis. The combination of island isolation and the Ice Age, which extinguished many species from the European mainland but not from the Canary Islands, has meant that large numbers of species exist only here. 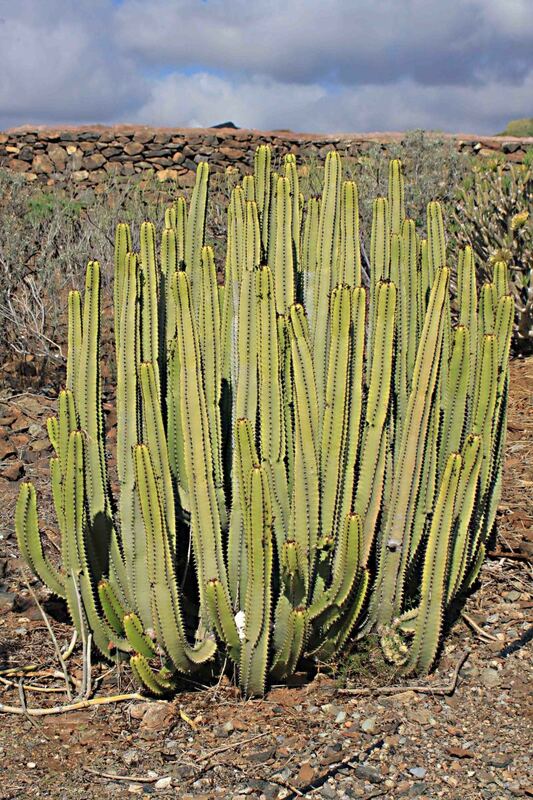 Many are endemic to the archipelago, and at least 100 are believed to be unique to Gran Canaria. A guide to the flora of the islands may be recommended for all interested visitors to enhance the experience of a day in the mountains. Travel through the central region and eventually for sure you will see the island's most spectacular scenic view; ironically, it is not of Gran Canaria at all, but rather the neighbouring island of Tenerife! The largest of the Canary Islands lies just under 64 km (40 mls) to the west, and its most prominent feature is Mt Teide, the great volcano which rises 3,718m (12,198 ft) above sea level - the highest elevation on any Spanish territory. 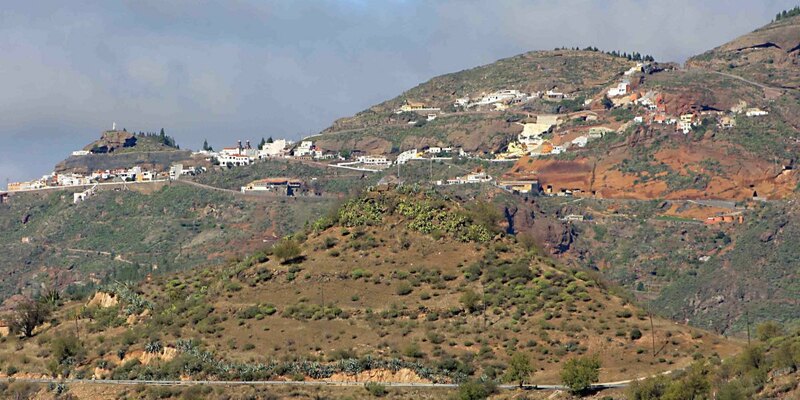 The photos here were taken on GC 60 between Cruz Grande and Tejeda. 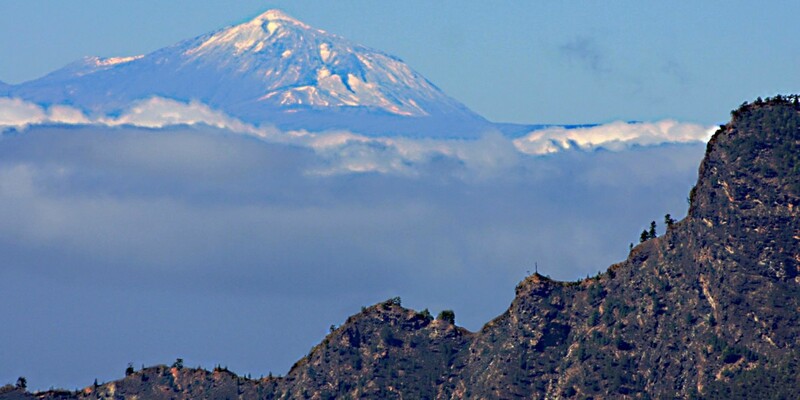 It may be that none of Gran Canaria's mountains are quite so spectacular as Mt Teide, but the island's inhabitants can boast the best panoramic view of rival Tenerife's own biggest mountain! 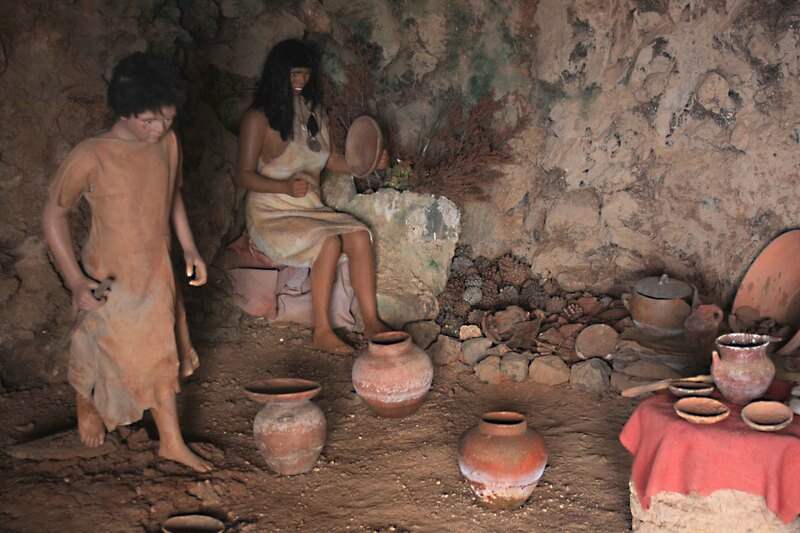 Some mention should be made of the pre-Hispanic inhabitants of Gran Canaria. It is not known for certain when the first human settlers arrived in the Canary Islands, but it was certainly more than 2000 years ago, and possibly as long as 5000 years ago. 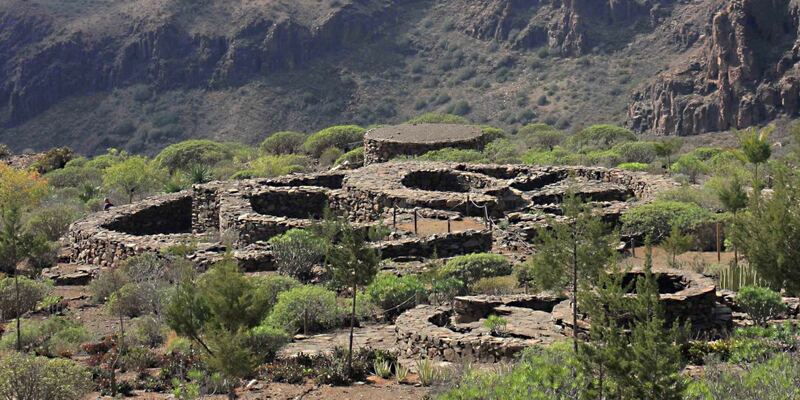 Gran Canaria was favoured by these settlers, popularly known as the Guanches, and several sites of cultural interest can be visited today. It's believed that the Guanches originally came from North Africa and their ancestry is thought to be derived from the Berbers of that region. The society was essentially Stone Age, living in caves or in stone dwellings roofed with branches and leaves, but with a sophisticated social organisation. There was no metal working knowledge, but the ability to carve and construct from wood and stone, and to bake earthenware pottery, and to make cloth from plant fibres and animal skins was well developed. Their diet was very varied, consisting of domesticated animal meats and other animal products including cheese and milk, as well as fish and seafood, beans, nuts and berries, and cereals such as barley. Ever since their first arrival here, the Guanches had lived in seemingly peaceful small communities. But this tranquil existence was eventually to come to an end with the arrival of Hispanic sailors and the conquest of the island during the latter part of the 15th century. The clash of cultures sadly led to the rapid eradication of the more primitive Guanche society, as the once 30,000 strong population dwindled through conflict with the invaders. Spain assumed colonial rights, and survivors of the anicent culture of the Canary islands were sold into slavery or forced to covert to Christianity. 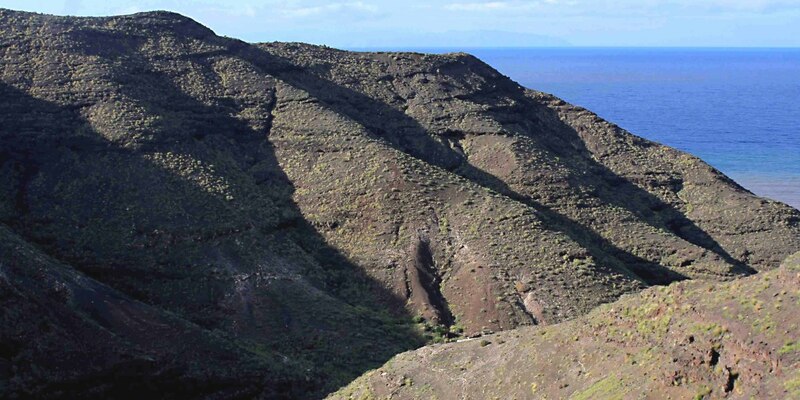 On this page I will look at two very different locations which emphasise the ancient guanche presence and which add great interest to any journey into the mountains. 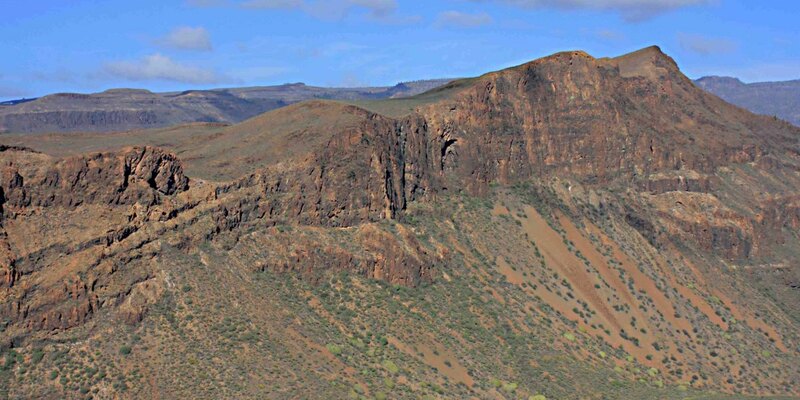 There are several sites of authentic historical appeal in these mountains, but if one travels along Route GC 60 towards Fataga, from the southern beach resorts of Maspalomas, Playa del Inglés and Playa de las Mujeres, the first site worth visiting is not an ancient ruin but a theme park. Mundo Aborigen may be a 'theme park', but it's a theme park without rollercoasters or other such popular entertainments. 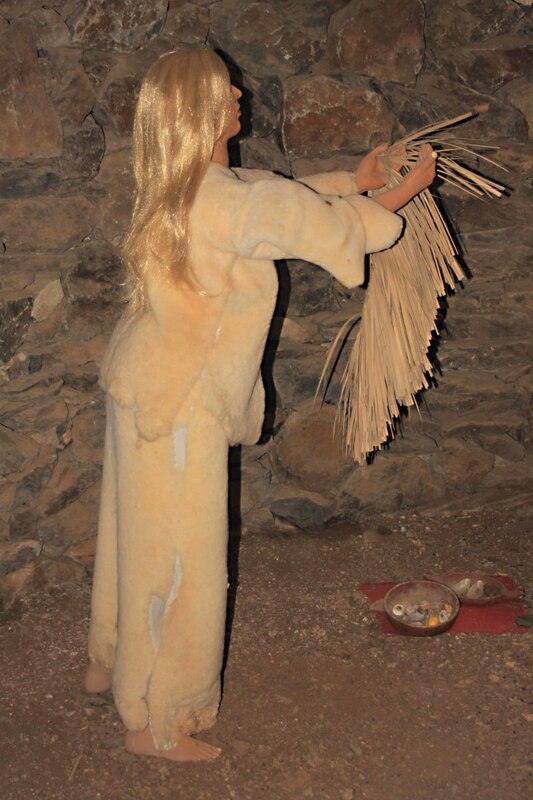 Rather it is a serious, educational and yet enjoyable and fascinating recreation of life in an ancient guanche village, and as such it makes a great introduction to these people, before going on to visit the genuine archaeological sites. 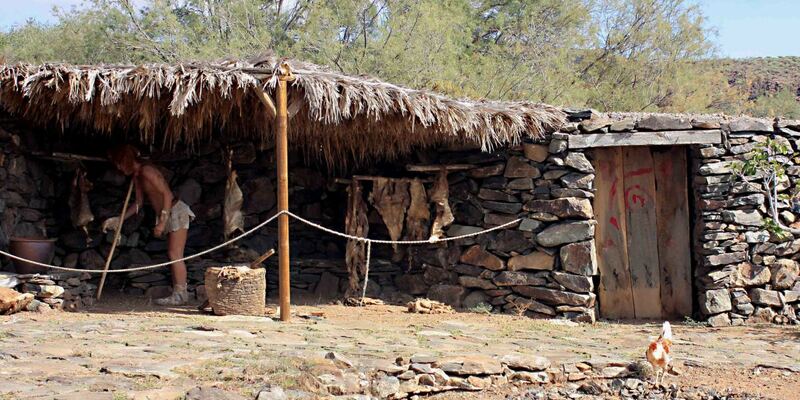 After passing through the park Visitor Centre, a pathway takes you through a succession of recreated dwellings populated by about 100 models of guanche villagers. There are exhibits of the houses of nobles and peasants, and recreations of pottery making and the practices of farming, as well as courts of justice, and mummification and burial processes. In fact, pretty much every aspect of the life of the ancient Canarians is covered. And each of the displays is fully explained in descriptive panels of information. 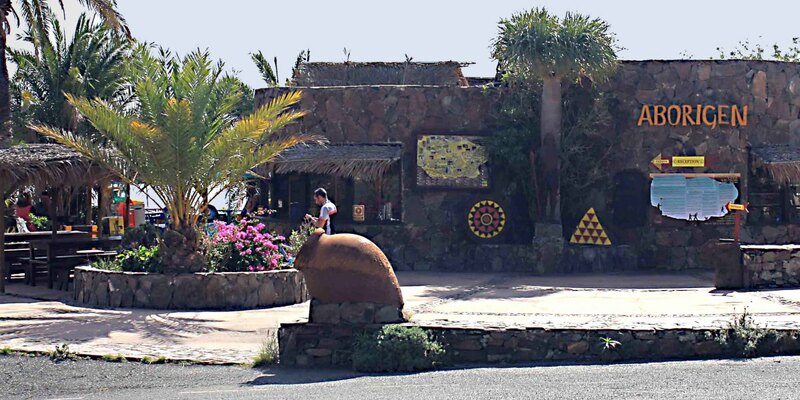 In addition to the reproductions of guanche buildings, arts, crafts and jobs, Mundo Aborigen also educates about the common plant species to be found in this region. Many of these plants which the visitor can still see up in the mountains are exhibited in the park, and labelled with descriptions, including the value the plants may once have offered to the ancient Canarians. Finding Mundo Aborigen is very easy. You can't miss it. There is a turn off and bus stop on the right side of the GC 60, but the main parking bays and the park itself are on the left side. The visitor centre is well equipped with refreshments and of course souvenirs, and the park itself is beautifully laid out. I'm not sure the human models would not win any awards at Madame Tussauds, but that is a minor criticism. Everything else about the exhibits appears to my untutored eye to be authentic. And for those who wish, a novel gimmick here is that there are several friendly pet dogs which can be taken for a walk around the park if you wish! A tour of Mundo Aborigen could be done in little more than 30 minutes but to get the full benefit, the visitor should read all the information panels (presented in several languages) and spend up to two hours here. I would certainly recommend a visit to this park for any who want to know more about historic Gran Canarian culture. A visit to Mundo Aborigen should whet the appetite to discover more about the guanches at a genuinely historic site. Close to the mountain village of Tejeda is Roque Bentayga, a basalt monolith which rises above the local terrain to a peak at 1,404 m.
The monolith is essentially a resistant volcanic plug (the central solidified lava of a long extinct volcano) left standing when the surrounding softer rock eroded away over thousands of years. The geology is interesting, but more interesting to most is that the monolith long ago became the site of a guanche settlement and place of worship. 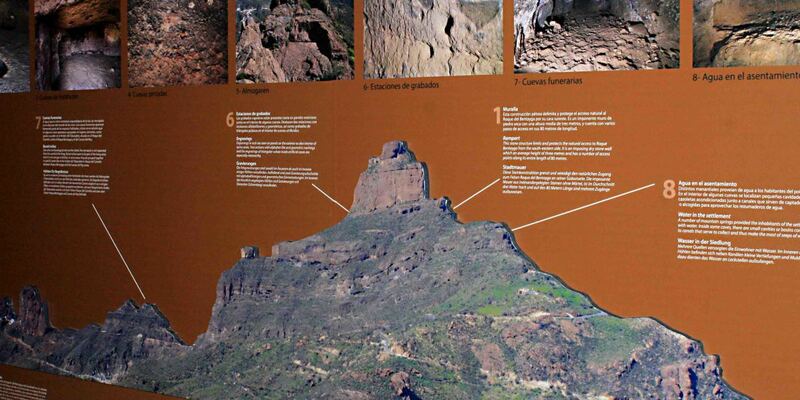 More than 100 guanche cave dwellings, grain silos and graves have been found on Roque Bentayga and in the vicinity of the Roque, including the Cuevas del Rey settlement to the west. On the eastern side is an excavated, flattened area known as the almogarén, believed to have been a place of worship, and a stone wall called the Bentayga Rampart on the eastern and southern sides may represesent the limits of this sacred area, or it may have been a defensive structure, used to protect this settlement during the early days of the Spanish conquest. Indeed it seems that Bentayga was one of the final retreats of the guanche people - a natural fortress of caves to shelter in and scene of an unsuccessful siege by the invading Europeans under conquistador Pedro de Vera against the resistance of local chief Bentejuí. The area has not been developed as a major tourist attraction though whether that will occur in the future may depend on funding and the natural inaccessibility of a cliff top site. But there is a Visitor Centre and museum and a pathway which can be walked up to the caves, and these will be reviewed in the next section. The Visitor's Centre and museum are certainly worth seeing. It is only small, but it is very well organised with nice exhibits, and professional interactive displays, a video presentation and very educational information boards. Two guides were at the Visitor Centre during my visit. I spoke to Narciso, who was happy to answer questions and was clearly enthusiatic about the Centre and the archaeological site. I should say that the road route up to the Visitor Centre is one of the few in the mountains without barriers - that should not worry those without an extreme fear of heights, because the road is wide and not busy. Equally, the path up to the Roque is in places quite steep and again without barriers, but the drops are not sheer and most are shielded by vegetation. I visited in the late afternoon and the need to get down from the mountains before darkness, and the fact that I was ill-equipped for a climb, meant that I was very limited in what I could see. 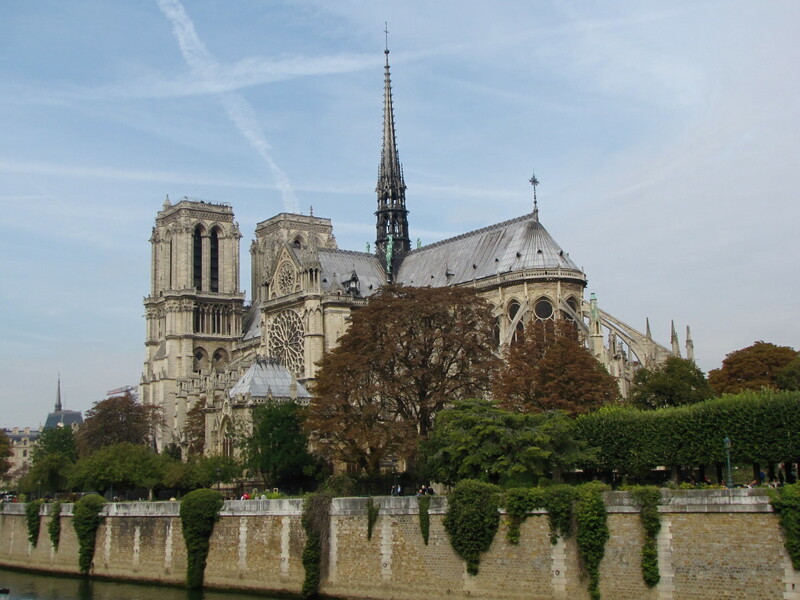 However, I will hope to return one day, and I would encourage all with an interest in human history, and with the fitness to climb, to pay this site a visit. 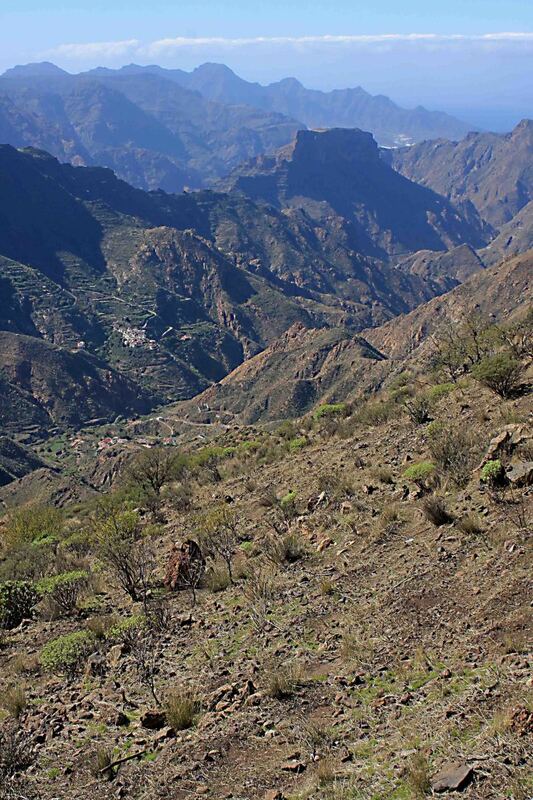 Described in earlier sections are just a few of the attractions of the central mountains of Gran Canaria. A brief summary follows of some other sights and sites in the mountains. Foremost of these is probably another basalt monolith. 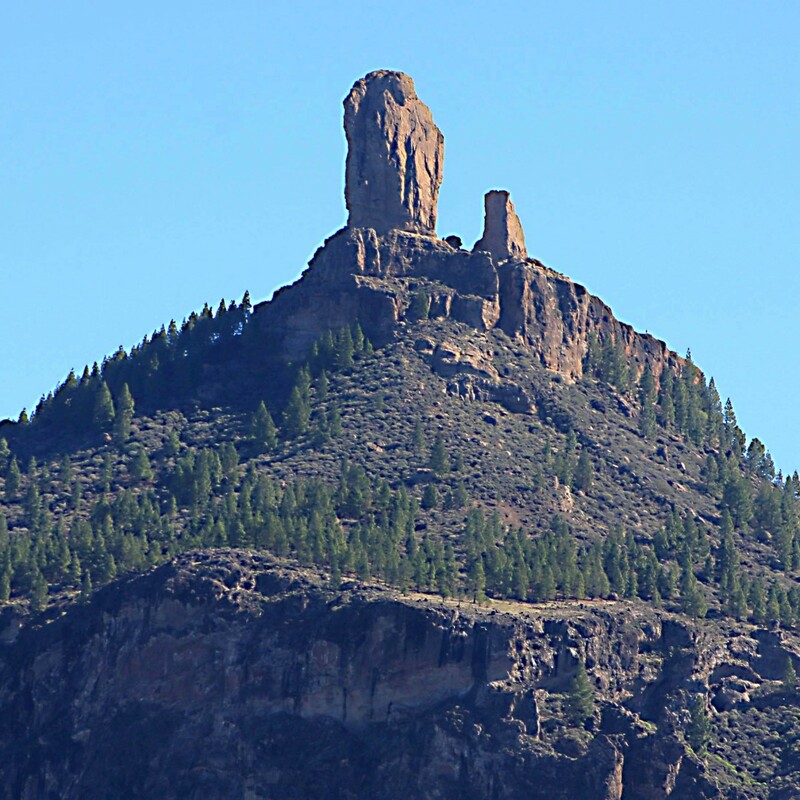 If Roque Bentaya is more significant for its archaeological interest, Roque Nublo is perhaps the more famous for its clear cylindrical shape and its picturesque setting on the crest of a ridge. No roads go close to the base of Roque Nublo, but there are good scenic views from GC 60 and there are also hiking routes in the mountains, one of which will take you close to the Roque.. Not far from here (6 km as the crow flies) is Pico de los Nieves, the highest peak on Gran Canaria, from which views of almost the entire island are possible. 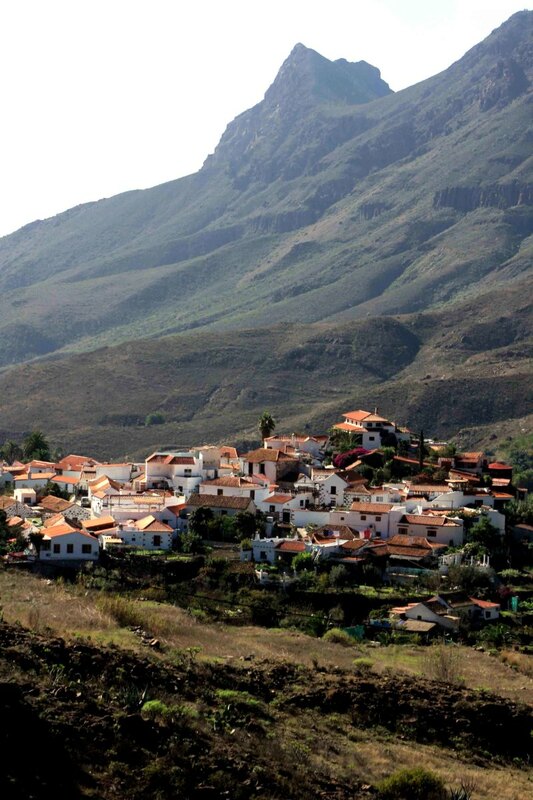 The villages of Tejeda and Artenara are two of the larger settlements in the central mountains, the latter being the highest village in Gran Canaria at 1,270m (4,170 ft). Artenara is also the site of many prehistoric guanche caves, and some of these have since been adapted into modern rock-cut houses by Artenaran residents. A little further along the road from Artenara are the Morro de los Cuervos caves where guanche rock art can be seen. (I intended visiting these, but the GC 210 secondary road to Artenara was closed on my visit, presumably due to a rock fall - such is the nature of life in the mountains! The map shows the GC 60 route (in yellow) through the central mountains, and the GC 200 route (in white) north along the west coast linking to the GC 1 autopista. Both of these are featured in this article. Other routes which head into the mountains are also shown, and by using the + and - buttons you can zoom in to see more detail and more of the villages. One can also opt for either a terrain view or a siimple road map. The greatest mountains on the island are to be found in the centre of Gran Canaria, and most attention must be focused here. But the west coast also features some high terrain, and some scenic, meandering roads which skirt the mountain peaks on one side and the ocean on the other side. There are also some beautiful rock formations here, and other sights to remember. Coming from the south coast resorts the route to take is the GC 1 autopista - the best road on the island. Follow this westward as far as it goes and then head north along the GC 200 road through Mogan to the town of La Aldea de San Nicolas. This route includes several mountains of 1000m plus, as well as outstanding geology, interesting plant life, and attractive detours to west coast beaches. Beyond La Aldea San Nicolas and heading further north to the town of Agaete in north western Gran Canaria, most of the mountains along GC 200 are under 1000 m, but here the road hugs the coastline and the cliff faces in one of the most spectacular winding drives on the island. 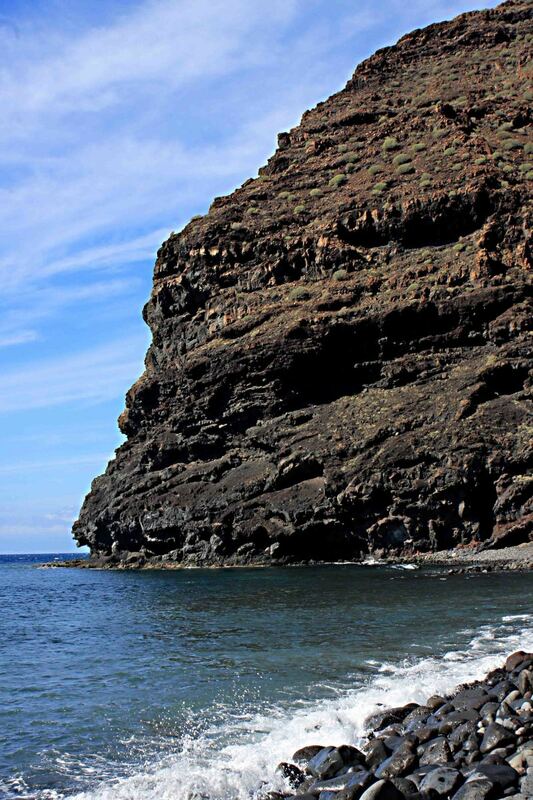 And near the town of Agaete is another of the archaeological sites which have such appeal on Gran Canaria. The Maipés Archaeological Park is a burial ground of nearly 700 tombs excavated at least 1,300 years ago. The tombs take the form of large mounds of volcanic rocks up to 8 m in diameter, and built around the grave. A Visitor Centre with paths and reconstructions makes the site tourist friendly. There are many interesting sights to be seen on the roads of the west coast, but one of the most attractive is surely a geological formation near the village of Tasartico, and that is the subject of the next section. 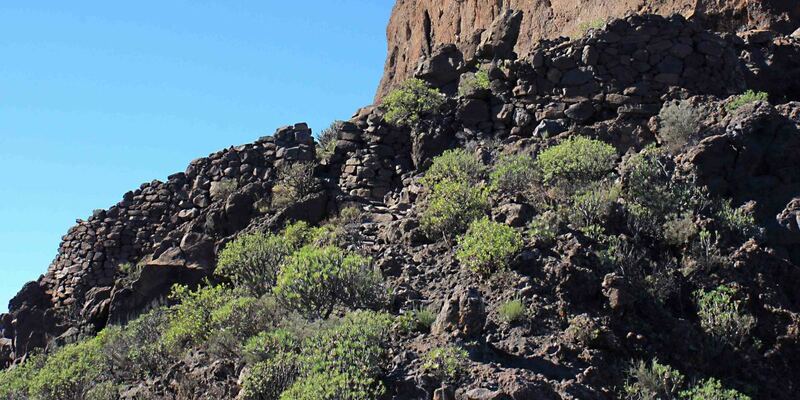 On route GC 200 between Mogan and La Aldea de San Nicolas, there is a strikingly attractive rock outcrop called Los Azulejos (a similar outcrop of the same name also occurs close to Mt Teide on Tenerife, and can be seen in a photo on my page about Mt Teide). The outcrop is a fine reminder of the volcanic nature of these mountains, as it was created by hydrothermal (water heated) mineralisation. 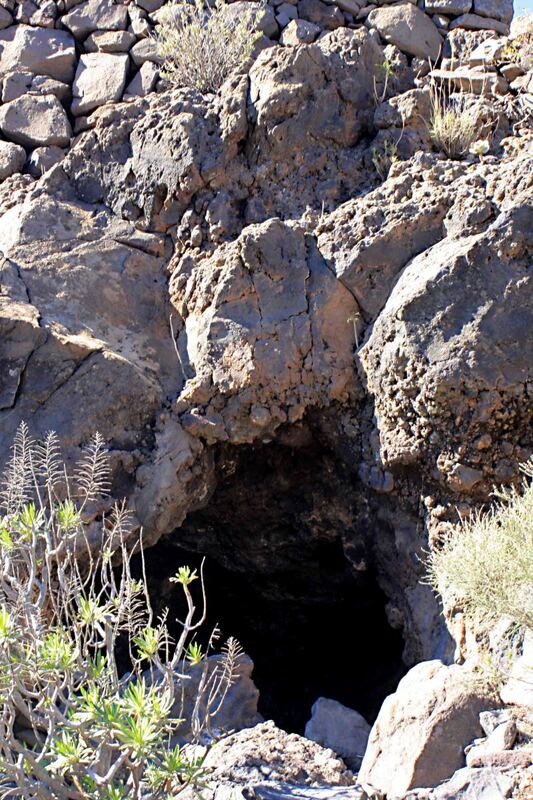 More than 12 million years ago, gases arising from volcanic vents in western Gran Canaria raised the temperature of subterranean water in excess of 200°C. 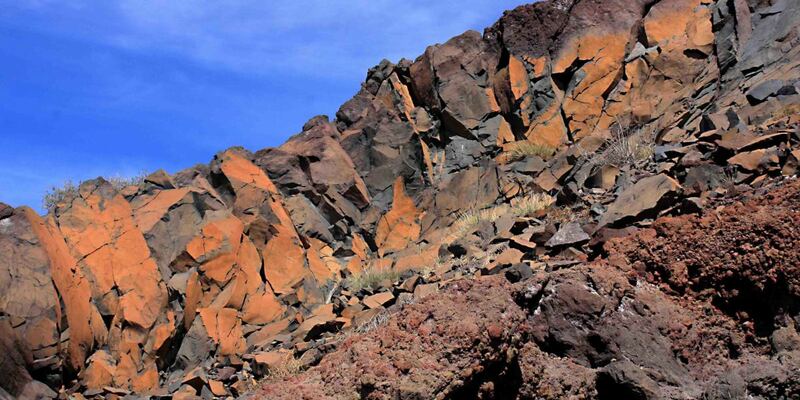 The impact of this heat on the surrounding rocks was to crystallise a banded range of minerals in colours of rust red, purple, yellow and - perhaps most characteristically - turquoise. The sight of these very colourful rock strata truly surprises as one rounds one of the bends of GC 200 and catches a glimpse of them for the first time. A parking area and a cafe and shop on the side of the road serve the visitor who wants to stop and take a closer look at this natural phenomenon. 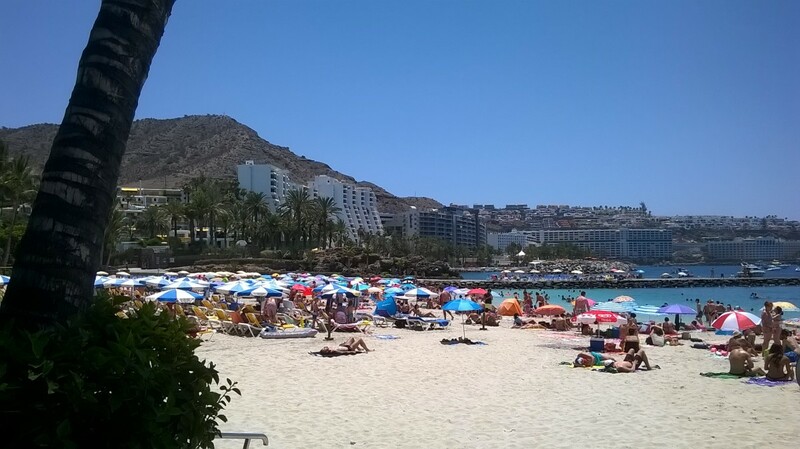 Tourists flock to Gran Canaria in their thousands, to the beaches and tourist resorts which line the coast. They come to sit on the beach, to bathe in the hotel pool, to drink in the bars, and to read a book whilst burning in the sun. And for some, that is all they will do on vacation. But for anyone who can appreciate outstanding natural scenery, it would be folly indeed to confine oneself to the tourist resorts. The mountains are a landscape of great beauty where there is something of interest to be discovered around every winding bend - a pretty little village, a rare and endemic succulent shrub, or a cave where a guanche once lived. Or just another scenic vista stretching as far as the eye can see. 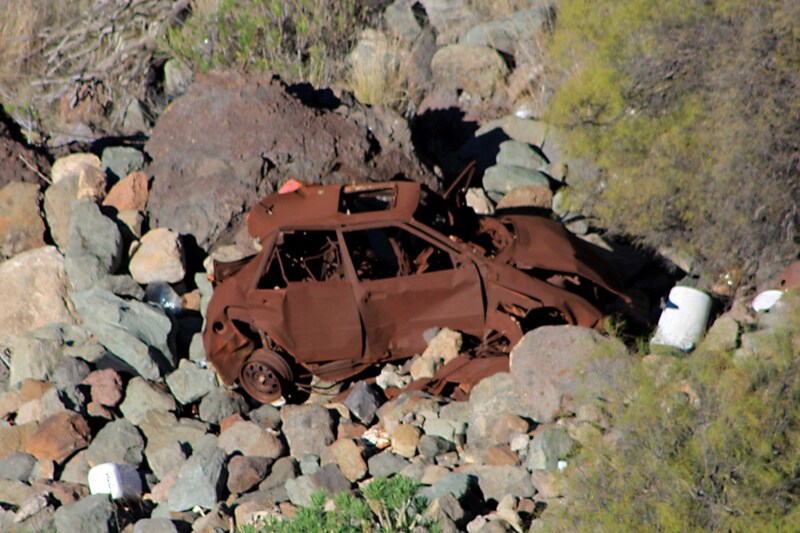 For anyone visiting Gran Canaria, take a coach trip, or better still hire a car and explore the interior. A day spent driving in the mountains will live in the memory far longer than a day spent sitting by the poolside bar reading the latest blockbuster novel. Believe me. Can I Find 'Cheep' Vacations in the Canary Islands? Fabulous views! Congrats on HOTD, a great history lesson. Thanks for the wonderful tour through this beautiful mountain paradise. Congratulations on the HOTD Alun. Well deserved. Alun, since I commented on this hub, six months ago, congrats on HOTD for this lovely hub! Suzie HQ; Haha. I can certainly understand the appeal of the kind of holiday you mention, but I think we'd now agree that when travelling to foreign lands, one must make the most of the experience and see as much as possible :) Thanks for all you say about the article, and about the Canary Islands. It is very much appreciated. Cheers. Yet again your attention to detail is evident here in abundance! What a fantastic journey through Grand Canaria at its best. Yes, I was one of those tourists mentioned when I spent a girlie holiday there when 21. Now older and wiser I would opt for this type of trip and many of the villages remind me of those seen in Southern Italy. 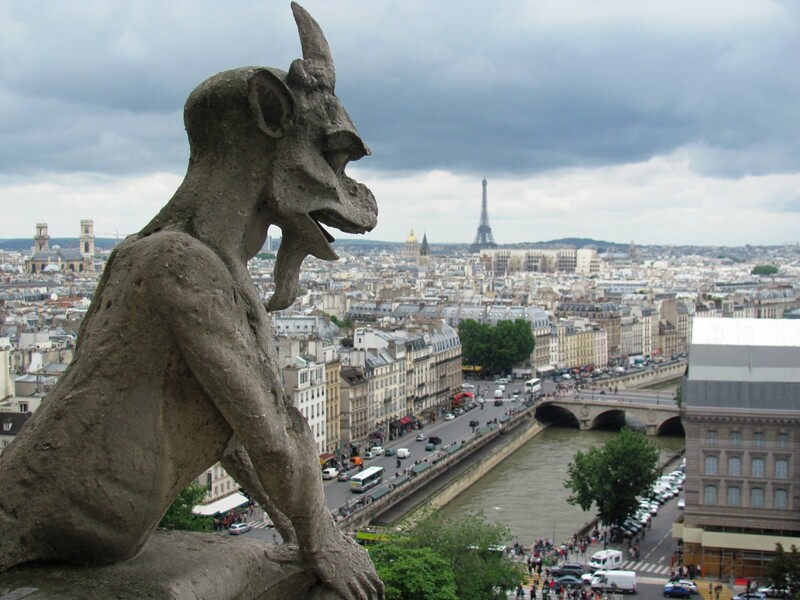 Your photos are superb and love the scare tactic ones! Having traveled to Lazarote too these islands have so much natural, raw beauty I would encourage anyone who has the opportunity to go visit. 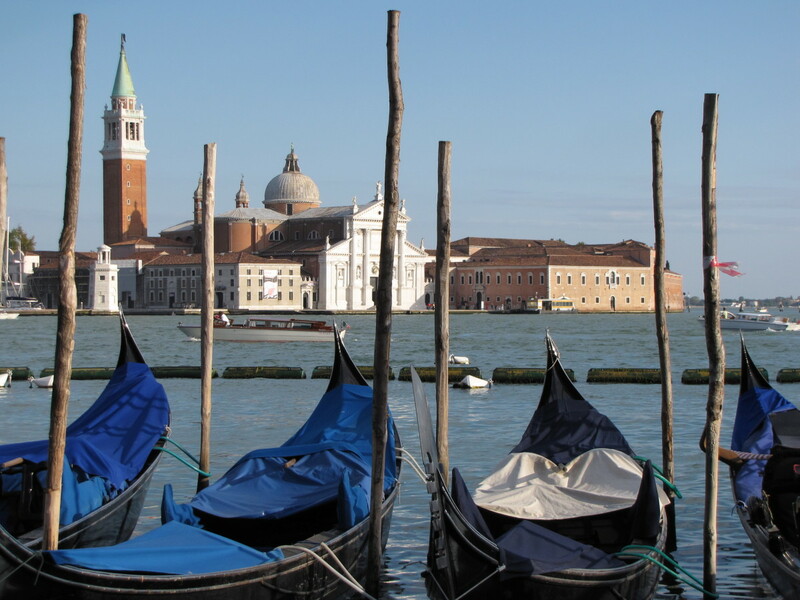 This is a wonderful guide and your travel articles never disappoint. Thank you for your very kind comments, I have been absent mainly due to major surgery a year ago. i am in the middle of writing my experience, my first writing in over a year so wish me luck! Thanks again for a gorgeous tour. Thanks for the Gran Canaria travel, totally enjoyable. Hills and mountains are among my favorite nature views. Cogerson; Wow, that's a pleasant surprise Bruce! Nice to hear from you. Yes, still writing here - I have thought of taking the plunge like you and opening a website of my own, but lack of confidence and Internet illiteracy have always held me back! Very nicely done, Alun. Glad to see that you are still producing quality hubs. The attached pictures really enhance the hub. bdegiulio; Thanks Bill. You know how much I respect your own travel writing on Hubpages, so I always appreciate your comments very much indeed. Hi Alun. I'm totally with you on this. The interior of Gran Canaria looks beautiful and the vista's amazing. I think I would love exploring the villages, historical sites and seeing the beautiful scenery. You did a great job of taking us into the interior of Gran Canaria and your photos are top notch. I thoroughly enjoyed the tour and appreciate the history of the island. Great job Alun, looking forward to your next adventure. amine-sehibi; thank you so much my friend for that wonderful comment. It really makes the effort of writing and presenting the article worthwhile, to know that it is appreciated. Cheers. Alun, this was a beautiful travelogue to a beautiful place. The photos were lovely and awesome to go with it. It sounds like a lovely place to go someday. Voted up for beautiful!